After a relatively bleak winter at the Granada Native Garden, with many natives dormant or slow to emerge because of the limited rainfall this winter, all is not lost! There are signs of spring all over the place, but you just have to know what to look for. Take these poppies, for example. 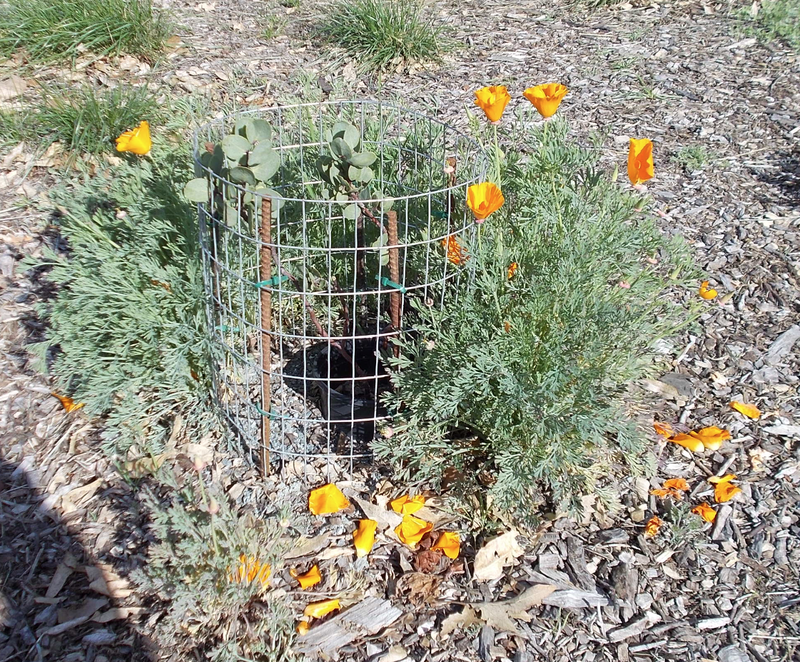 Coaxed into blooming a few weeks early because of some extra water shared with a caged-in baby bigberry manzanita planted last year, they anticipate the display of California poppies (Eschscholzia californica) which usually floods this section of the Granada Native Garden in March and April, depending on the rainfall we get. 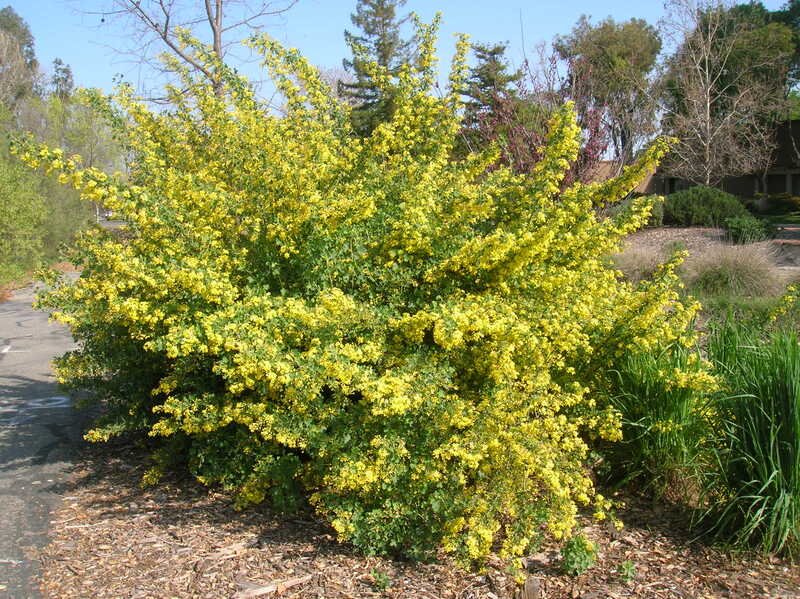 But the real eye-catcher this month are the golden currants (Ribes aureum), of which there are several currently (please forgive the unintended pun!) in bloom, like the one above along the bikeway at the north end of the Garden; an identification marker is there to help you find it and tell you about it. 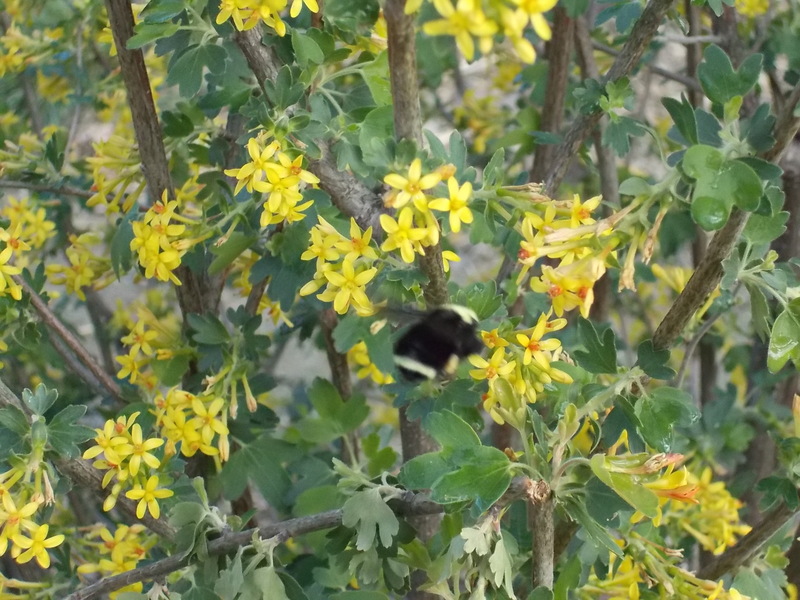 Bees love the blossoms now, but later in the season, the blossoms form small purplish-black berries, the currants, which were an important food source, fresh or dried, for Native Americans — exactly the way we use raisins now. The buckeye – very much alive! And those visitors who thought our buckeye was dead might be surprised to see it in full leaf again. 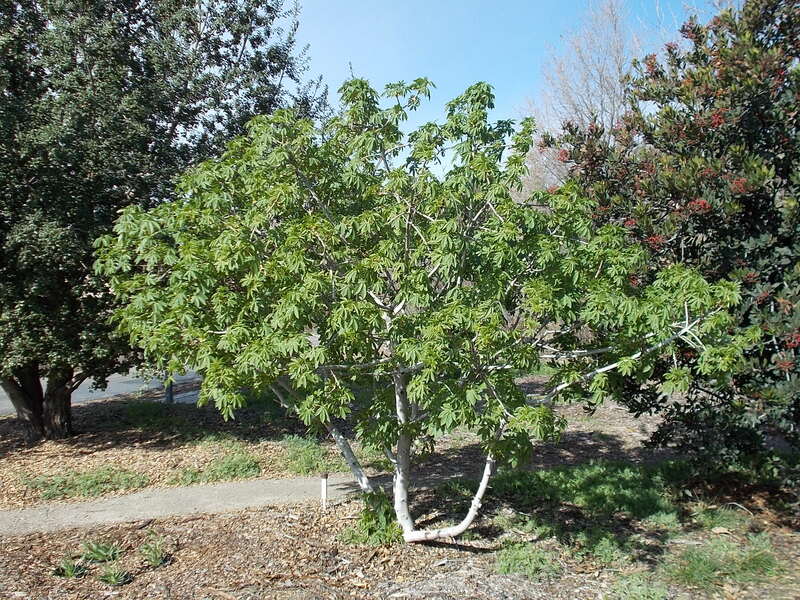 That’s the life-style of the California buckeye (Aesculus californica). It loses its leaves in late summer in order to conserve water; then it comes back in full foliage in the early spring. Stunning blossoms will follow in May, and golf-ball size seeds later in the summer. Less obvious additions to the Granada Native Garden are the soap lilies (Chlorogalum pomeridianum). Last year we planted 12 of them at the north end of the garden, and 3 more at the south end. All of them are leafing out now. 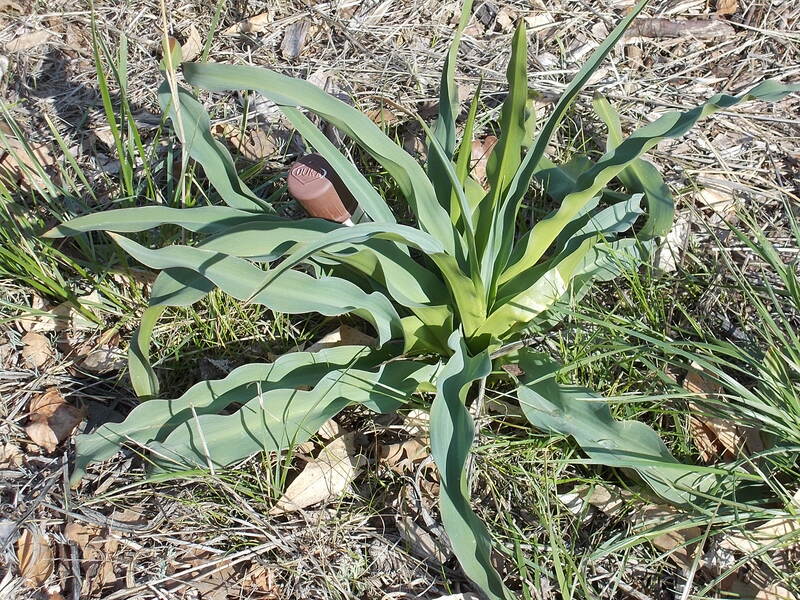 In May, they should be sporting tiny, lily-like blossoms several inches above the basal cluster of leaves. We will write about those interesting plants, so very useful to the Native Americans, in a future post. And last year we made an attempt to increase the population of blue and gold lupines at the Granada Native Garden, because they are such colorful harbingers of spring (a separate post about lupines was posted on April 29, 2013 and can be viewed in the April, 2013 archives). 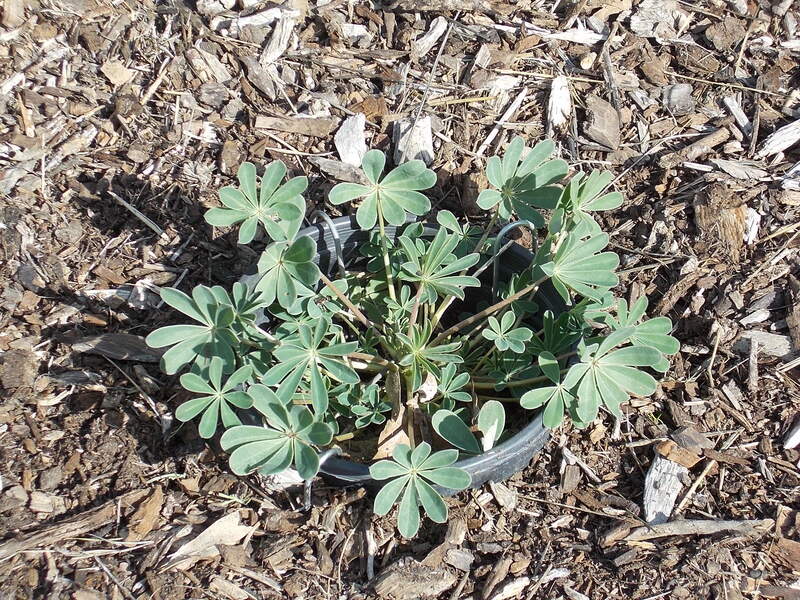 We germinated a few lupines in pots for transplantation recently, but we also spread seeds of both types in the Garden. The lupine above is one that was started from pots. The lupines from scattered seeds are just now appearing in the Garden, and we are looking forward to seeing them brighten up the Garden when they mature. Lupines self-seed freely from year to year. Unfortunately they are also reportedly highly relished by slugs and snails! Other Coming Attractions The early season native grasses, especially purple needlegrass (Stipa pulchra, formerly Nassella pulchra) and California melic (Melica californica) are appearing in bright green at this time of the year. The Garden’s lone native sycamore (Platanus racemosa) and the ubiquitous interior wild roses (Rosa californica) are showing their first leaves. A little harder to find is the bed of flat-topped goldenrod (Euthamia occidentalis) which threatens to take over the south end of the Garden. Last year’s Farewell-to-Spring (Clarkia amoena) is popping up again around the table area. We recently saw this year’s first flower on the columbine (Aquilegia formosa), one of the Garden’s original members. And California aster (Aster chilensis), which is supposed to go dormant at the end of the summer, never did entirely disappear, even without much rain. All of these will be much more evident in the coming months. So take a walking tour thru the Garden, and look for these and other signs of spring! Look closely, and you’ll be surprised how many things you may find.